The Kremlin has not decided yet how it should privatize Alrosa, according to official disclosures at yesterday’s cabinet meeting chaired by Prime Minister Dmitry Medvedev. The kickback, I mean kickoff of the diamond privatization worth at least $14 billion remains out of reach for the time being. Press statements by First Deputy Prime Minister Igor Shuvalov and cabinet presentation papers indicate a commitment to sell the entire 90% state shareholding, held in blocs of 50% by the federal government, 32% by the Sakha republic government, and 8% by the Sakha uluses (districts). However, there is no government consensus on how or when this should be done. Since mid-May Suleiman Kerimov has been promoting himself to Shuvalov as the buyer of the lot; his Nafta Moskva holding already owns 1%. According to the overnight reports attributed to Shuvalov and his staff, the proceeds of the Alrosa selloff should be reserved for the development of the Sakha region, but the timing of the share sales should be gradual. Alrosa and the Finance Ministry, which traditionally supervises the diamond sector, the state diamond stockpile, and Smolensk Kristall, the largest diamond manufacturer in the country, have recommended that a first-stage share sale should be limited to a 7% bloc of federal government shares and a 7% bloc of Sakha shares. The problem with this is that it may trigger a genuine bidding contest. If Kerimov fails to bid high enough for the 14%, and it is won by one or more rivals, his “strategic investor” scheme will collapse, and with that the risk that the ownership of Alrosa may be genuinely diversified. For Kerimov and supporters of his scheme, that would be too advantageous to the current Alrosa management and the Sakha government. 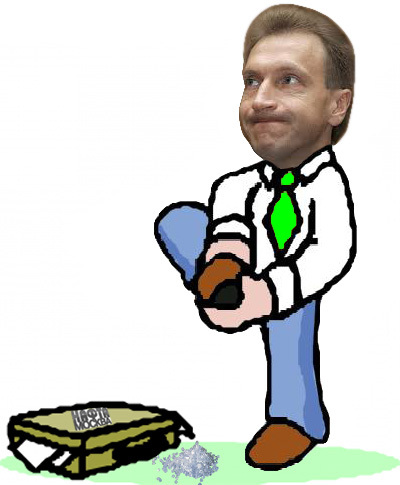 Yesterday Shuvalov, who has struggled with press disclosures of his personal financial gains from oligarch-controlled businesses, tried to avoid appearing to endorse the plan by Kerimov to buy 51% of Alrosa in a single transaction. Instead, Shuvalov was reported as saying the share sale options will be the subject of a consulting study in the “near future”, and only after that is completed, will the government return to a decision on what parts of Alrosa to sell, when and to whom.